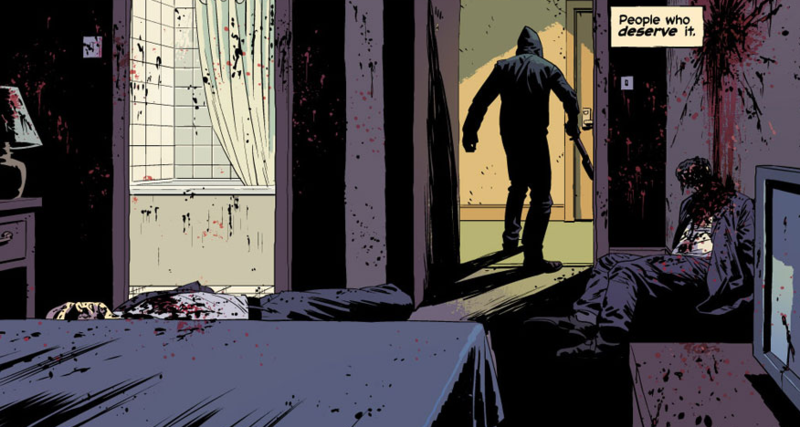 Kill Or Be Killed #1 Review – AiPT! Ed Brubaker (writer) and Sean Phillips (artist) have what could objectively be described as an excellent track record working together. Any series they create is virtually guaranteed to be good just by virtue of the talent involved. So when they come up with an intriguing premise like the one for Kill or Be Killed—a person who has to keep killing people so that he can stay alive—it’s pretty much a given that the book is going to end up on your pull list. This week, the highly anticipated first issue finally arrives. Is it good? The main character, Dylan, kind of looks like a gritty reboot version of The Shadow. He’s also either a total badass or has absolutely no fear of dying. Maybe both. Geez. Dylan’s flashbacks get more depressing each time he restarts them. Just when things can’t get sadder, they become completely weird and terrifying. Thanks a lot, Brubaker. You’re making me root for a guy who’s going to kill somebody even though he doesn’t want to. Now this is how you start a series. We already knew the art was going to be good. Sean Phillips and Elizabeth Breitweiser (colors) render characters and environments that are crisp, well defined, and beautifully bleak. The paneling adds to the action without ever distracting from the flow of the narrative. My only issue with the story (aside from a muddled time hop) was the end. We’re left in the middle of a flashback that seemed to be looping us back to a different place. Part of me was a little disappointed, but I was also excited about the possibilities. And therein lies one of main reasons that Kill or Be Killed pulls off such a fantastic first chapter. The story’s explosive opening, Dylan’s deteriorating physical/mental state, the hint of supernatural vs. the suggestion of psychosis—there’s just so much great stuff to ponder and chew on. And then you have Dylan himself, who Brubaker imbues with an uncomfortably relatable disposition. Kind, but a bit selfish. Hard working, but slightly self-destructive. Sympathetic to the point of being a hair’s breadth away from pathetic. He draws us into his plight via a comfortable second person POV dialogue with the reader, making you want him to succeed while also wondering how reliable of a narrator he truly is.